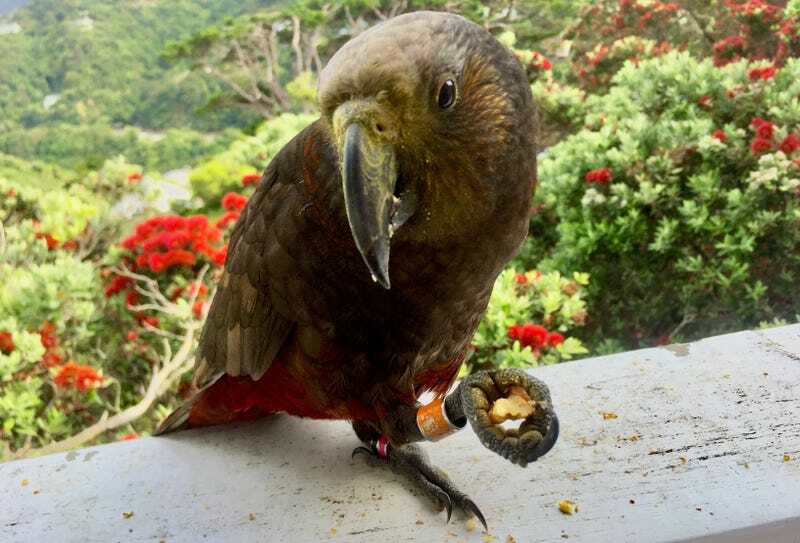 Early in the morning a few days before Christmas, I was sitting in the living room of my mom’s New Zealand apartment, typing away on my laptop, when a parrot flew up, perched itself on the balcony railing and stared at me expectantly, as if demanding that I bring it a treat. It was a Kaka parrot, a large, greenish-brown bird with a subtly burgundy underbelly that has long been endangered in New Zealand due to forest clearing and invasive possums that compete with the Kaka for food. The bird had tags on its ankle from nearby Zealandia, the city of Wellington’s impressive ecosantuary, which has bred Kakas since 2002. The last time I had been in New Zealand, the Christmas before, the only Kakas I saw were within the sanctuary walls. At one point, the Kaka was nearly extinct. But recent breeding efforts have been prolific, and now most mornings and evenings, as many as six Kaka perch themselves on my mom’s treetop balcony, squawking, presumably, in celebration of their triumphant comeback. Zealandia’s Kaka are a remarkable conservation success story. From just 14 original captive-bred birds, it has bred hundreds of wild Kaka that now flap freely around Wellington’s hilltop neighborhoods. Recently, New Zealand has been at the center of a heated debate over whether it is either feasible or ethical to use a cutting-edge genetic-engineering technique known as a gene drive to kill off the land-dwelling mammals that were brought to New Zealand by European settlers and that threaten its native birds. Gene drives are controversial for good reason: They work by overriding natural selection, allowing scientists to theoretically force a desired genetic trait through an entire wild population quickly. A gene drive that caused a species to only produce male offspring, for example, would wipe out the targeted population in just a few generations. While that might be a good solution to removing a species from an island nation like New Zealand, it could be disastrous if it accidentally spread further than intended. But the high-tech solution is not always the most effective one. In the case of a Kaka, it was breeding them behind fences that rise high into the sky and deep below the ground to keep out pests like possums. Now, New Zealand is close to perfecting a new conservation strategy that merges 21st century science with an age-old pest control technique: genetically targeted poison. It works like this: Scientists mine the genome of a predator species for DNA sequences specific to only that animal. It’s similar to how pharmaceutical companies mine human DNA for clues to curing disease, only in this case, they’re hunting for a sort of Achilles’ heel that would kill the animal if tinkered with. Once that DNA is identified, they then hunt for molecules that interfere with it. The idea is to then use that molecule to make a new toxin that would harm only the targeted animal when ingested. That means the toxin could be distributed more liberally and effectively, with (hopefully) no consequences to other animals in the same ecosystem. Species-specific toxins aren’t a new idea, but so far, no one has actually pulled it off. One developed in the 1960s for rats, Norbamide, got close, but it was so fast-acting that rats would start to feel the effects before they had actually eaten enough to kill them. New Zealand is now on the verge of having a species-specific toxin for rats, and the scientists working on it expect it will be ready to commercialize in the next two or three years. Researchers have also begun work on sequencing the possum genome to look for targets to develop a toxin against the invasive marsupials. As Warburton mentioned, low-tech solutions like traps and poison can be very effective if designed and implemented well, but it can be difficult and expensive to deploy them on a large-enough scale to have a significant effect. Aerially deploying toxins mean the distribution is less targeted. And common poisons like brodifacoum can wind up hanging around in the environment for a long time. A species-specific toxin could be distributed widely, and in areas like schools, zoos, and food warehouses where generally you wouldn’t want to be tossing around poison. The technology is being developed as part of a bold plan announced in 2016 by the New Zealand government to eradicate all wild predators by 2050. Introduced predators, including possums, stoats, and feral cats, have for generations wreaked havoc on New Zealand’s native bird populations, many of which evolved to be flightless in predator-free bliss. As part of the program, the country has invested $28 million in a new joint venture company, Predator Free New Zealand Ltd, with the stated goal of achieving a “scientific breakthrough capable of removing at least one small mammalian predator from New Zealand entirely” by 2025. Both the species-specific toxin and gene drive are among a handful of technologies related research is exploring. Brian Hopkins, the scientist leading the research at Landcare Research, told me that they have successfully identified a rat-selective toxin and have teamed up with a pest control product manufacturer to develop it. Finding a target for possums is the next goal. The genome of New Zealand’s brushtail possum is currently being sequenced to look for targets. Hopkins said that because all of New Zealand’s marsupials are pests, they might also be able to target genes specific to marsupials in general. Already, they have identified several potential DNA sequences to target. But, Hopkins said, it will still likely be a decade before anything is ready to be commercialized, if it works at all. As much hype as the gene drive has gotten as a sci-fi cure-all for New Zealand’s conservation woes, the species-specific toxin is much closer to implementation, and much more likely to get the stamp of approval from GMO-wary New Zealand. Targeted pesticides could very well wind up being key to save the country’s unique native wildlife.